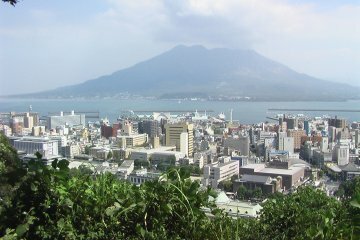 Kagoshima City is set against the backdrop of Sakurajima, an active volcano and the city's icon in Kagoshima Prefecture. The prefecture's capital city is likened to the Italian city of Naples due to its climate and presence of a volcano. Sakurajima can be accessed by a 10-minute ferry ride from Kagoshima's port and visitors can get around the island by hiking trails, or by vehicles such as rental cars, sightseeing buses, or bicycles. 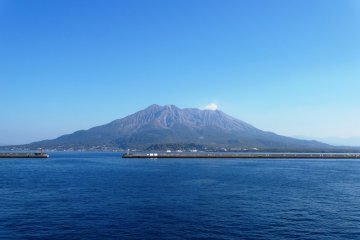 The volcano has three peaks: Kita-dake, Naka-dake, and Minami-dake. There are several observation decks around the volcano where visitors may witness mini eruptions from Minami-dake's Showa Crater at a safe distance. In the city center, there are shopping complexes scattered around and Tenmonkan, the largest shopping district in south Kyushu, is located downtown Kagoshima City. Just a little north from downtown is the Senganen Garden, a Japanese landscape garden that features Sakurajima in its scenery. The garden features a wide variety of plants that bloom at different times of the year, allowing visitors a chance to be visually treated all year round. Kagoshima also has much to offer in terms of food such as satsuma age (deep-fried fish cake) and the "Black trio" of Wagyu beef, Berkshire pork, and Satsuma jidori chicken - the name is derived from the black colors of the animals used to make the dishes. Wagyu beef from Kagoshima is said to be the top in Japan, which will definitely entice beef lovers to the region. Near the end of the year, the Kagoshima Ohara Festival is held. The entire city descends into downtown Kagoshima for a lively performance over two days and it is a great opportunity to experience the city's atmosphere. Kagomma Yataimura offers diners the chance to try Kagoshima specialties in cozy food stalls a stone's throw from Kagoshima-Chuo.. This Kagoshima-based soup curry franchise delivers hearty and mouth-watering Japanese soup curry from Hokkaido. In Kagoshima city on Japan's Kyushu island, Chisun Inn is a good value, well located business hotel, within easy reach of transportation,.. In the centre of Kagoshima on Japan's westerly Kyushu island, Hotel Gasthof is full of middle-European charm and character,..